"My staff and I appreciate your visit and hope to be of assistance to you. My office is continuously updating and upgrading in order to better serve the public. If you need assistance, please feel free to contact us. I’ve been able to assemble an outstanding staff of individuals who are intelligent, capable and friendly. We’ve implemented state-of-the-art technology and the staff is trained to maximize the efficiency of this technology. I am proud to say that we are recognized as one of the most advanced clerk of court offices in the state of Louisiana, if not the nation. 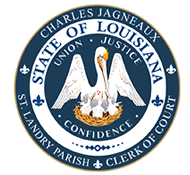 Thank you again for visiting the St Landry Clerk of Court website and we look forward to serving you."